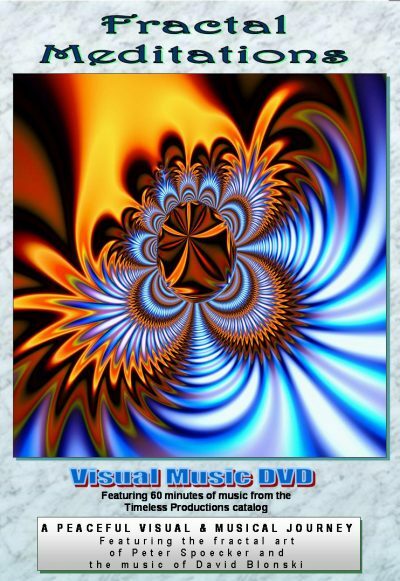 Music for the eyes and ears (visual music), Fractal Meditations is a peaceful journey into the world of fractal art as created by visionary artists, David Blonski and Peter Spoecker. The musical score, provided by David Blonski and friends, creates a sense of enchantment and beauty that melds perfectly with the images on screen. Whether you view this DVD all the way through of just view a single segment at a time you will find that the music and imagery with carry you away to provide a moment of peace and tranquility. Any of the 11 video segments can become a perfect computer companion to provide a short getaway from mundane or stressful tasks. Features 60 minutes of music from the Timeless Productions music catalog with a continuous 5-hour loop feature. The demo below is shown in 4:3 full screen but the DVD is also available in 16:9 Wide Screen format.